Did you hear that whooshing sound? That was the sound of the winter holidays speeding by! Our weather went from frigid winter to late fall warmth in the blink of an eye too. The sun is shining and the temps are up to the low 50º F which, for this time of the year, feels lovely. The urge to get out to paint becomes a roar on days like these. I haven't painted as much as I would like to due to the seasonal celebrations. My mate and I spent the afternoons of Christmas Eve and Christmas day on Short Sands Beach. It is a 5 minute drive up the road and about a 1/4 mile hike to the beach through a beautiful old forest. The trail to the beach runs along Short Sands Creek which empties into the sea. Christmas afternoon we took Twill's ashes to their final resting place. We still had them as I had a purpose for a tiny bit of them to remember her by. That will be included in a future post. She is now resting in a perfect spot where there are many dogs to visit her and a beautiful beach to enjoy. 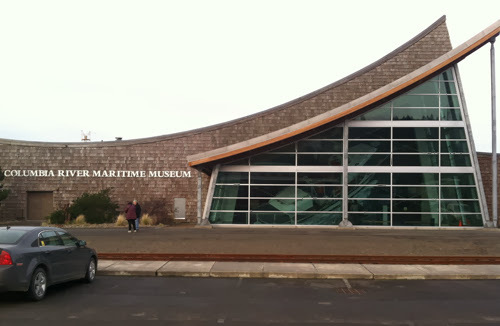 Before Christmas, I took a field trip to the Columbia River Maritime Museum. It is one of the best Maritime Museums in the state. The Columbia River meets the open ocean close to Astoria. The river is still quite mighty when it hits the sea and makes the Columbia River bar crossing one of the most dangerous in the world, even to this day. They had awesome footage of a huge cargo ship being tossed around in the waves. Even on a good day the crossing is tricky. I could go on for a whole post on the museum. I have been there before but needed to do a bit of research for a painting I have in mind. I decided to paint a sketch as I am just starting to paint the rocks and trees. A bit of a change and I felt anxious the whole time I was painting. The light changed so fast. 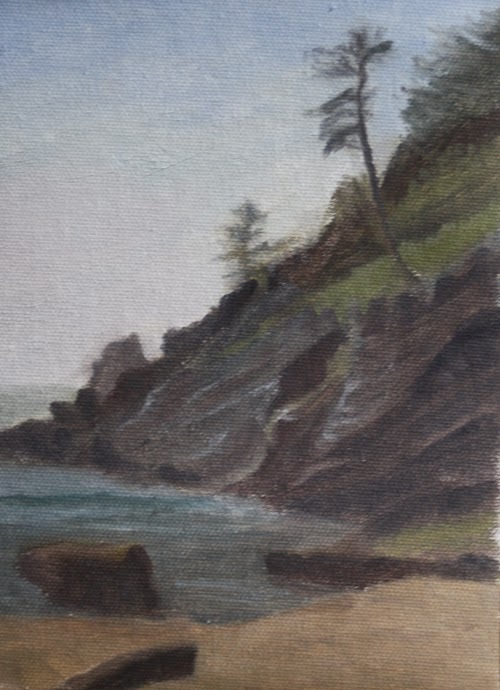 I need to take a different approach than the one I use for painting the waves. The rock formations in this area are beautifully layered sandstone with jumbles of basalt scattered out to sea. The wind and water carve the sandstone into fantastic shapes and caves. Where we live, the forest meets the sea and creeks, streams, and waterfalls cross the sands into the waves. 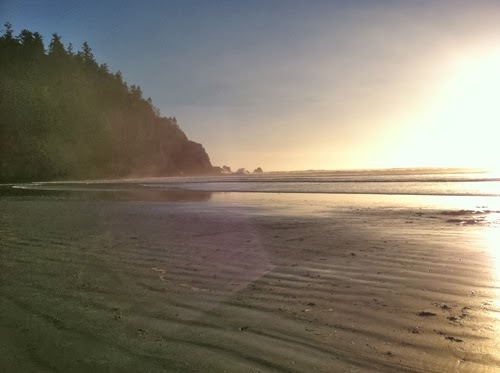 The Oregon Coast is a beautiful place. I could have painted several different paintings without even moving my easel. The clouds will be returning over the next few days. I will be spending time getting ready for the January challenge and refining my goals for the new year. I am also happy to report that two of my paintings have sold! Oh I LOVE that new painting. Beautiful composition Renee, you have grown by leaps and bounds. Isn't the weather just different this year? So glad Twill has found a perfect resting place and you have a special place to commune with her. It's important. Wishing you a very happy new year, filled love, creativity and adventure! Hi Theresa and thank you! Yes, the weather is very strange this year. I have a feeling we are going to have to get used to it. It is a comfort for Twill to have her spot. It was harder than I thought to let her ashes go but she belongs where she is, not on a shelf in a plastic bag inside a plastic urn. I have a tiny bit of her sealed into a beautiful piece of dichroic glass. I am enjoying your journey with your new loom. Can't wait to see what you weave on it!